You hear many bad things about Socialized Medicine (aka, Government-run healthcare), such as this article from the Heritage Foundation and, on the other hand, you hear many good things, such as this article in the Las Vegas Sun newspaper; so who do you believe? You can believe this: everyone will always try to sell you their “bill of goods” and will always malign the competition. You can also believe that many true “horror stories” have arisen from the current U.S. healthcare system, just as they have from the Canadian, British, German, etc. systems of socialized medicine. But the important thing to remember is that all of the above is, in the end, unimportant because it distracts us from the one important issue: freedom to choose! 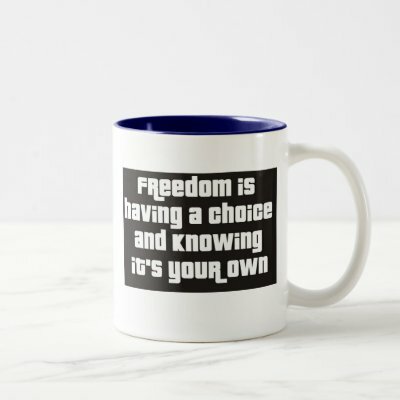 Under any government-run healthcare plan (even if it begins as just an “option”) we will loose our freedom to choose. Up until now, our healthcare has been a matter of individual choice. If you want health insurance you can have it — if you don’t you can opt out. If you like HMOs or public clinics or private doctors or faith healers or any other type of healthcare provider, its your choice. With a government controlled healthcare system your choices will, no doubt, be limited, you MAY be forced into purchasing health insurance even if you don’t want it, you MAY be funding abortions, you MAY be paying for healthcare for millions of people who are in this country illegally, you MAY see what the Obama Administration calls the “Public Option” be the ONLY option when, in the end, health insurance providers can’t compete with a government system that doesn’t require a profit or even balanced account books. Why all the MAYs in the above paragraph? Limbaugh, Hannity, and all the other Conservative pundits always tell you “it’s in the plan” but they’re selling their own bill of goods. It’s NOT in the plan because there IS NO PLAN! Everything up until now has been proposed and it’ll stay proposed until a piece of legislation has passed the House, has been modified and agreed to by the Senate and the House and reaches the president’s desk. IT’S REALLY IMPORTANT THAT THAT NEVER HAPPENS! That must NOT happen while we have people in powerful positions in the Legislature who drool over the prospect of turning the United States into a model European country. That must NOT happen while we have a president who is so out-of-focus he has forgotten everything he must have learned about American history, American traditions and the free-market economic systems that made the United States into the richest, most powerful country in the world. “Leveling the playing field” and “Economic Justice” are two phrases President Obama used when he was running for president (he also threw in a comment about the Supreme Court’s inability to address “redistribution of wealth”) and these are the phrases that made it crystal clear what direction he wanted to take this country; I said that during his campaign in this post and every proposal he has come up with has proven me right. Yes the current system of healthcare has some major problems that are driving up the costs to healthcare consumers and, with the Federal government’s help those problems could be fixed — but not right now! With President Barack Obama in office, a fix MAY not be possible until he learns to focus and remember that he is the president of the United States and in the United States it is the people who are free to choose and who have the right to choose well or choose poorly; in the United States, it is the government’s responsibility to protect that right.